Our introductive courses are accessible to anyone who is physically active. Kids can be introduce into a session from 8 years. In our courses, you will learn to row properly with the paddle, balance on the board, adopt a good standing attitude, hold a rowing course and discover how to manage your board and having fun doing freestyle. 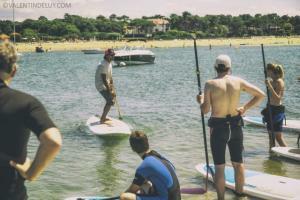 We offer stand up paddle course for kids and parents from 12 months. 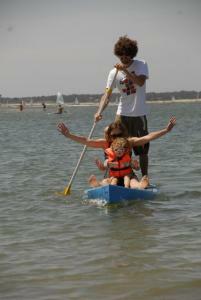 Supervision by our instructors allows to structure learning as a game between children and parents. 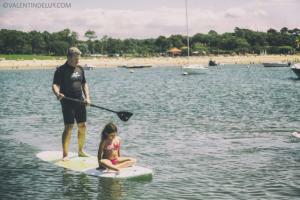 We give to the parents the basics of the smooth SUP discovery in the same time. The prices depends on the time spent with the family and number of children. 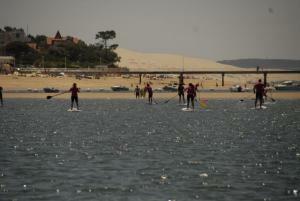 1 child: 60 € / h for 2 children € 70 / € and 3 children € 80 / h.
– Having already practiced sup in flat water. – Know how to circumvent the surf zone to reach the peak on prone surfing. Topics include using the current, passing the whitewater waves, placing on the peak, the take-off and front side and back side maneuvers. 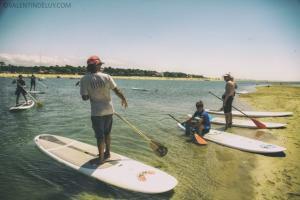 We do not teach beginners directly to the ocean for obvious reasons of safety and comfort. Possibility of photos and videos. Rates depending on the period and practice time.